Get ready for the event of a lifetime! Whether you’re watching the solar eclipse in the path of totality or getting a little glimpse at home, you can have fun with the kids by making these easy cookies. If you haven’t heard about the Solar Eclipse event happening on August 21, I’m sorry to say you may have been living under a rock. The news of it has been everywhere! We live in Utah so we are close to our friends in Idaho who will get to experience a total eclipse. I know a lot of people who will be going up there, including my little sister. I’m still contemplating taking a little drive up there to experience it too! But no matter where you are, even if you will just catch a piece of it, you can still teach your kids about space with fun learning activities and treats. My kids and I whipped up these fun cookies this afternoon in preparation for the event and I’m sharing it with you! The great thing about these cookies is that you don’t have to bake anything and you can grab everything you need while at the grocery store (except maybe the candy melts). 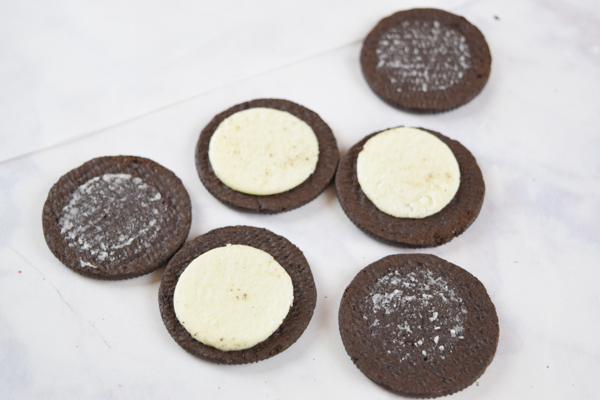 To make your own solar eclipse cookies, you need a package of Oreos (double stuff would work better! ), toothpicks, candy corn, and yellow candy melt. 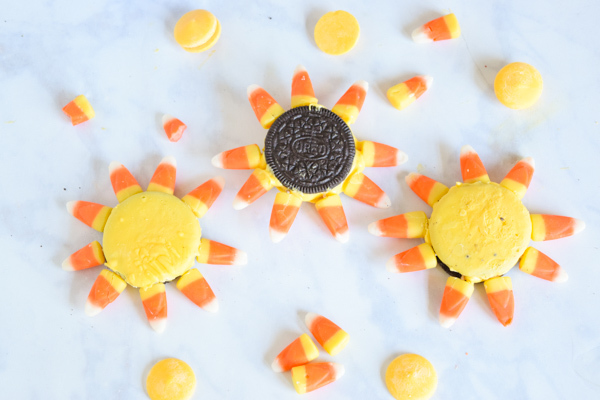 If you don’t want to deal with the candy melts as much, you could also use the vanilla Oreos for the backside. It’s just not as bright. First, separate the Oreos carefully so you have a top and a bottom. Melt the candy melts. I admit that I’ve been bested a lot of times by candy melts and I’m still a work in progress. But I learned a tip to put some coconut oil in with them while you microwave to keep it more smooth. It works pretty well! 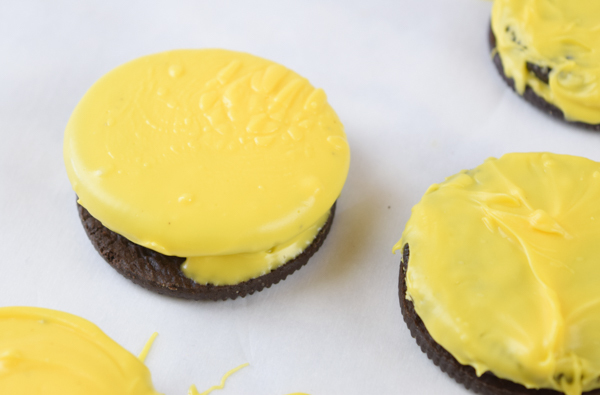 Dip the tops of the Oreos, the ones without the filling, in the candy melt covering both sides. If you’re picky about having a smooth top, you can bring the other half underneath it and sandwich them together rather than on top (like I do in the video). If you’re impatient, you can pop them in the freezer. Cut the ends of the toothpicks so they’re shorter. 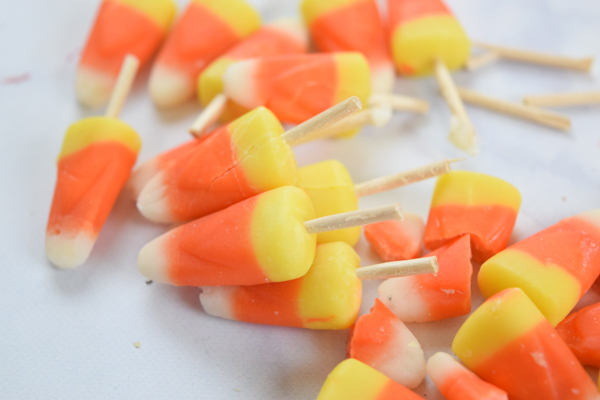 Use the pointed ends to push into the candy corn. When the Oreos have hardened, bring them out. Begin inserting the candy corn into the middles carefully. 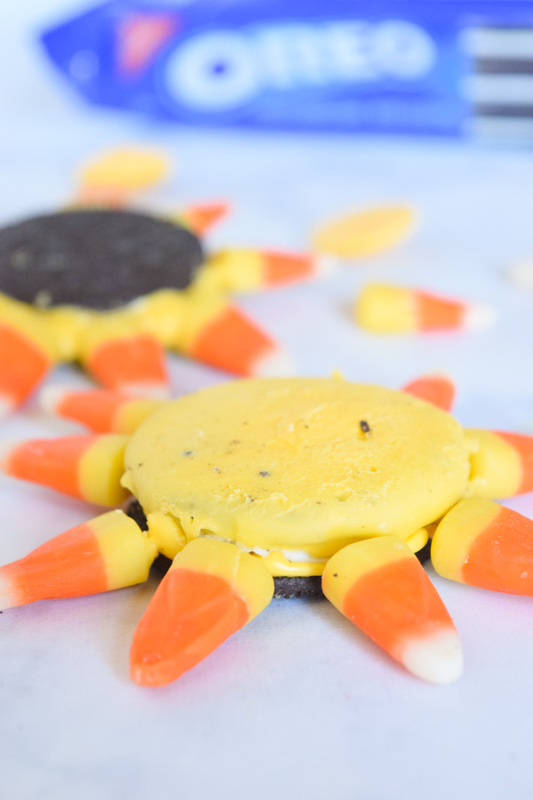 You’ll need 9 candy corn per cookies. NOTE: I did have some of the Oreos come apart at this point. If this happens to you, lay one side down and place the candy corn around the edges. 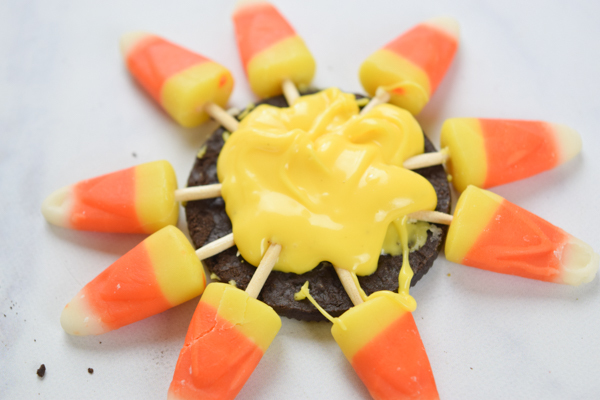 Pour more candy melt in the middle of the Oreo, covering the toothpick ends and then squash the top back on! The candy melt will hold it together like glue. 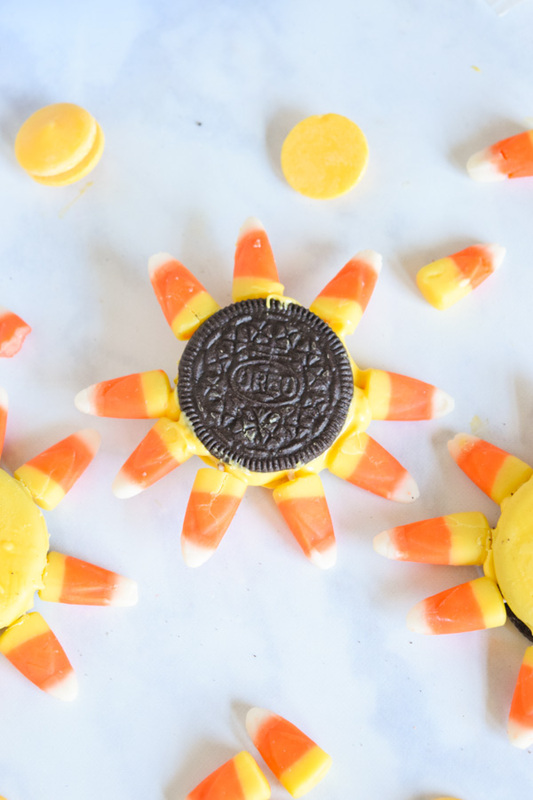 If you choose to use the vanilla Oreos with the regular, you may still need some candy melt or melted chocolate to act like glue for the candy corn. It just depends on how much filling you have in your Oreos!